My tranquil haven of a home has officially become a zoo. To the one dog we got when my kids were small, we have recently added a sickly bearded dragon, two ball pythons, two mice, and this week we completed our collection with a pair of ferrets. All these in a house of a woman who swore off animals for good as I have a hard enough time taking proper care of all the humans in my life. My one consolation in all this is that we haven’t added any more babies, human or otherwise. After three kids, two cats, and a puppy, I draw the line at potty-training or house-training anything every again. Did I say three kids? 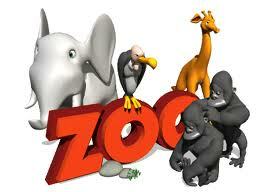 Let me correct that as sometimes I believe my husband reverts back to being 12 again where animals are concerned. He’s been just as bad as the kids at badgering me to accumulate our menagerie. Our most recent edition is a great example. Let me give you a little backstory: Before the bearded dragon, before the snakes, and before the mice, I’d promised my 9-year-old daughter she could get a ferret—one ferret—for her 10th birthday which is in October. She’s been asking me for one since she was 8. No, not asking. Pleading. Beseeching me with those big brown eyes. I’ve felt like Scrooge on more than one occasion. But nary did my resolve waver. Ten, I declared repeatedly. Not until you are 10. Why ten, you ask? Because that’s the minimum age encouraged on the ferret cages at Petco. Plus it put the dreaded date far enough away that I was hoping she would forget all about it. No luck. She really wanted a stoat, a distant relative of the ferret but as they’re a protected species, they’re illegal to own. Then she wanted a fennic fox—cute little thing with huge ears—but they’re like $1400. So we came back around to the ferret—one ferret. 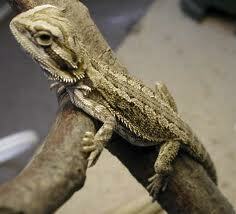 About 3 months ago, I agreed to a single lizard. I’ve handled iguanas before and while they’re not my favorite animal (I don’t have a favorite animal), they don’t freak me out. My girls—with a little prompting from my hubby, I’m sure—wanted something a little more exotic. So they excitedly explored Craig’s List and found a bearded dragon, a very sedate lizard that’s actually quite cute—for a lizard. Figuring that they had broken my resolve, the future zookeepers of my family, fueled by my 12-year-old husband, asked if they could get a snake—one snake—of which I generally have little or no fear as long as I’m not caught off-guard in the wild by a rattler. After another diligent search with our girls on Craig’s List, my husband came home with two snakes, one of which proceeded to escape after only a couple of weeks. We never found him. I kept waiting to smell his decaying corpse from behind the range or under the frig, but alas, I think he escaped to the wild through one of the doors my kids perpetually leave open. Ah, I know what you are thinking. I was vindicated. God was with me. I had only wanted one snake and now, through some divine act of the Merciful Creator, we only had one snake. But if you thought that, you’d be wrong. 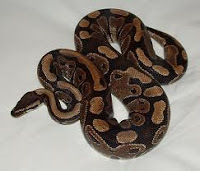 A week later they acquired a second snake—yes, on Craig’s List—another ball python to breed with the first. Think about this, we’ve now gone from one snake to not just two, but a potential family of snakes. Surely God was playing with me? The one thing about snakes, our snakes anyway, is that they need to eat live mice about once a week. (It’s quite the National Geographic experience to watch a snake hunt down, suffocate, and then eat a little white mouse right there on your kitchen table.) So to save time and an extra trip to Petco, someone in the family decided to get four mice instead of two and just keep the uneaten ones in separate cage for a week. With two little girls already hankering for a furry rodent*, can you say “bad idea”? Now you know where the mice came from. Once more my family was looking at the petnography on Craig’s List—yes, I believe it is just as addictive and dangerous to family values as the human version—when they found a family whose house had burned down only months earlier and were desperately looking for a home for the surviving ferrets. They were desperate because they were moving to Naples on Wednesday and needed to get the ferrets—two brothers they didn’t want separated—a new home by then. This was a like a pair of Tiny Tim’s and I was refusing to give them shelter. The guilt was unparalled. But I was shrewd. Someone else surely would want such a furry treasured duo. The needy family didn’t even ask for a dollar amount although the animals were worth $175 a piece and their cage—which was obviously mandatory unless you wanted a pair of rampaging ferrets chewing up your computer cables and stealing your shoes—had cost them $300. Because I’m the better typist, I actually keyed-in the email response to the advertisement myself while my eager family watched. I used my superb writing skills honed on blogs like this very one to write a response making us look like a worthy adopting family, offered them a “measily” $250 which we really didn’t have anyway, thinking, surely they wouldn’t choose us. Then just to make me seem like I was really being spiritual about the whole thing—because surely God would not do this to me—I asked us to pray about it as a family. And so we did. 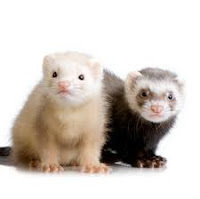 Just before I pressed the SEND button, we prayed that if it was truly God’s will for us to have these ferrets, that of all those people in world who responded to the email, we would be the chosen family. Then I went home confident that I still had six more months to prepare for a ferret in my house. The ferret family had 50 responses to their ad. And, because you already know the rest of the story, you know they picked us. The betrayal of my God and Protector left me speechless—for about 30 seconds. And then I started writing this blog. So once more, God has chosen to take me to new levels of faith and patience. This time with ferrets. Go figure. I surely didn’t. But as you are all my witnesses here and now, we will not get that puppy one of my clients is trying to sell us—an adorable little chihuahua that fits in the palm of your hand—that my children are pleading for, and that even my husband is drooling over. No, absolutely not. *To redeem them, and so you know I’ve done my research, ferrets are NOT rodents. They are actually in the weasel family (which I thought were rodents, too) and they are related to the sea otter. Who wouldn’t love an otter?